I completely agree with you. I'm glad you feel that way. .... Well said ..had Vallabhbhai been the first Prime Minister of India, we would have been a BETTER nation . Absoulutely...but even i forgot that it is Saradar Vallabhbhai Patel's birthday today.I think it is media's duty keep sensatizing the audience about all this ...well what do i say its all about TRPs. Public memory is too short. What is in front all the time is generally seen & noticed. Inspite of the total ignorance from all the mediums, as u hve rightly mentioned, there are still a few people like u who hve done smething to keep the word goin, is very nice. Because Vallabhbhai Patel was a no nonsense person, he was not very well liked among his peers at that time & those peers who were then in power never let his due credit be given...n unfortunately tht thing got carried on till today's times. @Ruchita : Yeah. Media has become either TRP game or a mafia who extracts money or a medium to please a particular party.. phew. @Nagraj : Spot on! Couldn't agree more! @Biraj : Righto. In political field, it's rare to find someone like Sardar. Because he was a no nonsense person, rest of the nonsense people made it a point to ensure he was not remembered. I truly appreciate your thoughts. At least, Indian media could have spent 5 minutes for Sardar Patel. As a media professional I must say it is media’s responsibility to sensitize people. However, now times have changed. Inspite of the fact that media is the voice of democracy, we must sensitize ourselves with our own concerns like saluting the freedom fighters if we really want to save our history and culture. Completlety true my friend ...you have forced to ponder over what you said..
Shame on us that we do not remember the Iron Man! We owe our existence to this man. 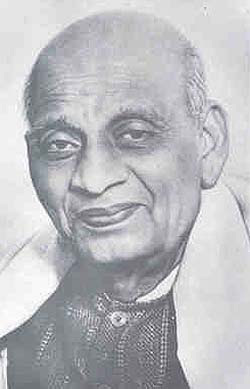 Had Nehru not intervened in J&K, Sardar Patel would have ensured J&K would never become a problem for India! But, India didn't come into existence in 1947. It was re-united in 1947. India was a much bigger country than what stands today. It is the invaders, right from Babur to British who destroyed India (Bharat)!